There was panic on Sunday on the Third Mainland Bridge, Lagos State, as emergency management workers blocked the bridge for a simulated road accident. From the scenario, five vehicles, including a LAGBus, had been involved in a multiple crash which resulted in loss of lives, just as a commercial bus plunged into the Lagoon. While some of the ‘victims’ were rescued, the ‘dead’ were removed and put into an ambulance. A crane was later deployed to pull out the commercial bus from the Lagoon, as 20 boats, occupied by marine policemen and local divers, coordinated the water operation. Some motorists, who heard or witnessed the accident, took to Twitter to raise the alarm and warn others. One Olu Dee warned motorists to avoid the road. “If you are coming from the Mainland to the Island, avoid 3rd Mainland Bridge, I repeat avoid Third Mainland Bridge. It is currently blocked due to an accident and vehicles are turning back,” he tweeted. The General Manager of the Lagos State Emergency Management Agency, Mr. Adeshina Tiamiyu, who coordinated the simulation, allayed the fear of residents, saying the state government created the accident. He explained that a recent crash in which a retired air vice marshal and his driver drowned prompted the state government to organise the exercise to test the preparedness of emergency workers in the state. Tiamiyu noted that over 15 emergency responders were involved in the simulation, which started around 2am. He said, “The exercise is a live simulation, codenamed Oko Jasosa (vehicle plunges into the Lagoon). You will recall that last year, there was an accident on this bridge in which one of the vehicles plunged into the Lagoon, killing two of its occupants. We knew the challenges we faced in retrieving the vehicle from the water. What we have done is to recreate a situation like that and what we can do when such happens. “We have also done this to create a synergy among our sister agencies, deliver what we have practised and test our response capacity and capability, including the use of hi-tech equipment recently procured by the state government. Adeshina, while encouraging residents to call the state’s emergency toll-free lines, 767 and 112, during emergencies, said the agencies would review their performances after the exercise. Aside from LASEMA, other agencies involved included the Lagos State Fire Service, Lagos State Ambulance Service, State Environmental Health and Monitoring Unit, Lagos State Traffic Management Authority, Lagos State Neighbourhood Safety Corps, Lagos State Waterway Authority, Rapid Response Squad, Marine Police, National Emergency Management Agency, Nigeria Security and Civil Defence Corp and the Federal Road Safety Corps. The Governor of Lagos State, Akinwunmi Ambode, who was represented by the Permanent Secretary, Ministry of Special Duties and Intergovernmental Relations, Dr Demilade Longe, said the government was committed to the safety of residents. He explained that the state had made huge investment in emergency management to safeguard the lives and property of residents and gain the confidence of investors. During the exercise, It was observed that there was traffic congestion on the bridge as many people going to places of worship were stranded. The bridge, at some points, was temporarily shut. The statement, issued by the state Police Public Relations Officer, SP Chike Oti, said, “The Third Mainland Bridge was temporarily shut to traffic this morning, April 29, 2018, due to a simulation exercise carried out by NEMA, LASTMA, the police, the FRSC and other agencies of government. “The objective of the exercise is to achieve a coordinated response among these agencies, which are usually the first responders in emergency situations. 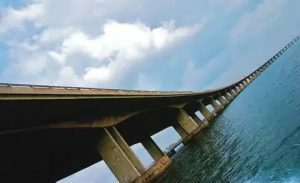 0 Response to "Panic as Lagos state government “creates” accident on 3rd mainland bridge"